Ever wanted to know what people think of Earth? Google Maps lets you leave reviews for pretty much anything you can search for — including whole continents and oceans. 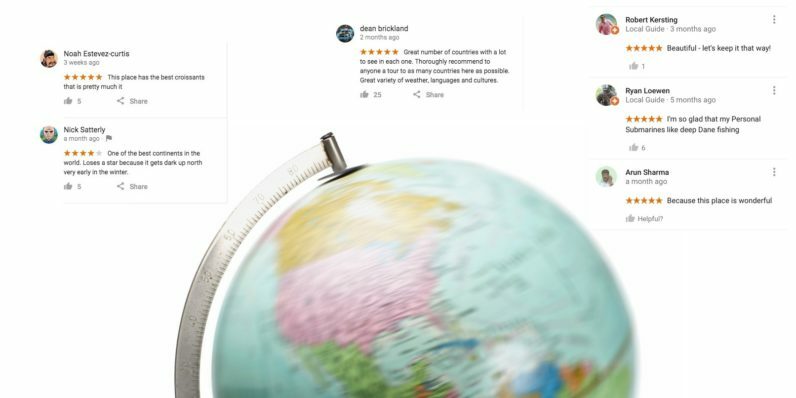 The denizens of the internet never let a good opportunity go to waste, so they’ve left thousands of reviews for the Earth’s largest physical bodies. It’s all pretty tongue-in-cheek, but some of them are brutal. The source of inspiration for most of Monty Python was a bit less inspiring. South America is cheaper, has a larger screen and better quality speakers. The reviews are fun to peruse if you need a laugh. You’ll even find a handful of them which take the whole concept seriously. Sadly, I couldn’t find any reviews for Australia. Everyone go show the Land Down Under some love! Update: Apparently some of these reviews don’t show up for everyone, as evidenced when my boss and I both searched for Antarctica. So if any of you have reviewed Australia (or Oceania, sorry), I apologize for not finding your reviews.